We are now coming into the next three-month period of deep acceleration with the Festivals of the Christ, Wesak, and Humanity through the months of April, May, and June. These energies help to set the stage for all initiates to fully step into the next phase of their initiation process. The Festival of the Christ falls on April 4th, 2015 during the Full Moon in Sun Sign of Aires. This festival represents the movement of “resurrection” for each individual. It is a time for each of us to go deeper within ourselves and remove the aspects that no longer serve our purpose as we move into the Wesak Festival. There are three keynotes that represent this festival. The first is the keynote of “love”, the second is “Resurrection”, and the third is Contact with the Spiritual Hierarchy. It is an opening of a doorway to work more directly with the Office of the Christ. Previously the Office of the Christ was represented only by Lord Maitreya, but now he has joined forces with Lord Kuthumi. This is due to the increased responsibility of bringing the Christ Consciousness to humanity on an individual basis within the planet. The Forces Of Restoration are very predominant during this festival as it will help individuals to think and act through the spiritual level while helping others to do the same. This essence comes directly from the Will of God and is connected to the principle of Active Intelligence (Pink Flame). It will assist in changing the consciousness of the planetary structure and the way that we live with one another. It is at this time that the planet receives the highest frequency of Light. 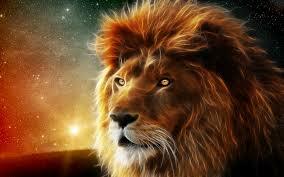 It is a living event based on current astrological cycles. It is the Festival of the Buddha, celebrating the anniversary of his birth, his attainment of Buddahood, and his ascension. He represents the embodiment of Light and Divine Purpose. The releasing of certain transmissions of energy to humanity that will stimulate the Spirit of Love, Brotherhood, and Goodwill. The fusion of all men and women of goodwill into a responsive, integrated whole. The invocation and response from certain cosmic beings if prior goals are achieved. Wesak is a time of great renewal and celebration. It represents the “force of enlightenment”. These energies are affected within our educational movements, values, literature, publishing, writers, and speakers on the entire planet. The power of these energies is so great that large groups of people gather around the world to participate in these energies. Every individual upon the planet is affected by the Wesak energies; it assists initiates of all levels to move to another level of their initiation process so there can be times of great challenges that push each of us into a new aspect of our soul’s essence. It is a time to connect with others, share your gifts, love, and generosity of spirit. All of the Ascended Masters and Beings of Light travel to Shamballa to celebrate Lord Buddha and the entire God Force during this powerful time of light. It is important to fully take time to allow the energies to enfold within each person’s full body system as it is an opportunity that should not be missed. The Festival of Humanity occurs on the Full Moon in Gemini on June 2, 2015. The Festival of the Spirit of Humanity aspires towards divinity, attunement to God’s Will and right human relationships. This is when we take the energies we have received from Wesak and put them into practice. It represents the effects in human consciousness of the work of all Masters but especially with Lord Buddha, Lord Maitreya, Lord Kuthumi, and Master Jeshua/Lord Sananda. It is also recognized as World Invocation Day. The Force of Reconstruction is very prevalent during this festival. It represents the Blue Flame of Will and Power, the Will aspect of Divinity, that is directly connected with Shamballa. This depicts the qualities of the three forces of Restoration, Enlightenment, and Reconstruction which expresses the Light, Love, and Knowledge of God. This is when we put to use what we have learned from the previous two festivals. Wesak pushes us into a new dimensional reality which needs to be grounded. Within the full moon of Gemini is when we start to put into practice what we have learned and share with the world. 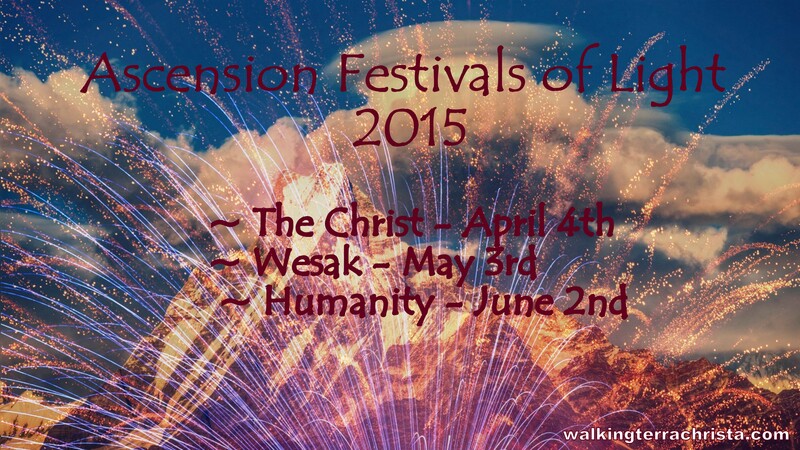 Walking Terra Christa will be holding tele-calls for all three of these festivals. We will provide more detailed blogs on each of the festivals prior to the actual date with information on how to join us. Our first festival will be held on Saturday, April 4th at 10 AM Pacific. Please see the details on how to join this call via Open Tele-Calls Registration. The power of the Wesak Festivals is beyond what we can imagine and hope for within the planet. It is due to the changes that have occurred within the Earth so that more frequencies of light can be grounded into GAIA. There are more individuals awakening every day but so many initiates need guidance to understand what it is they are feeling. The Mastery Pathway is not easy within a physical body, as each of you knows. 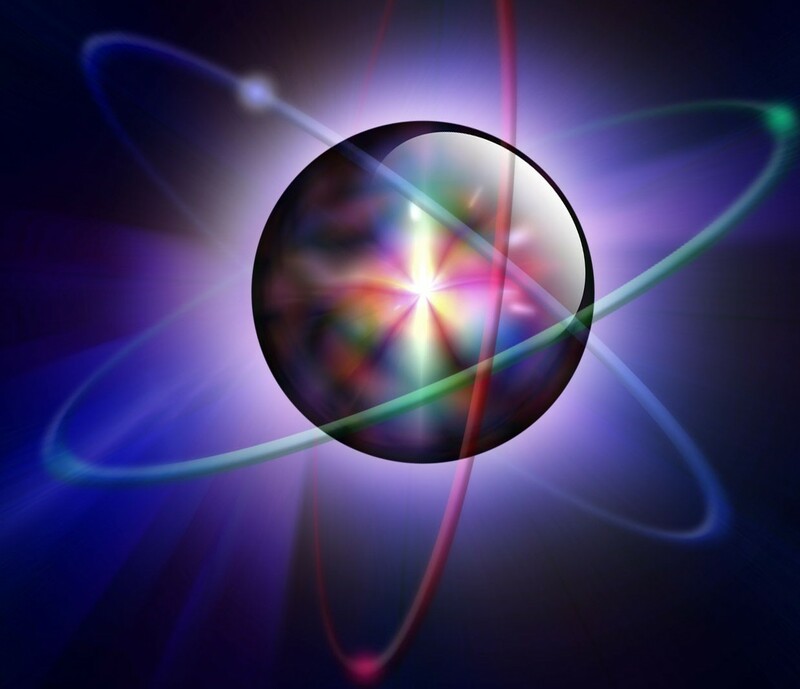 Each initiate must go into the depth of their core essence within the Etheric Body to balance the old elements and ills that they have experienced in the many lifetimes upon all planetary life whether it is on Earth or another planet. The purging that needs to be done is beyond what any mind can fathom. It is for this reason that the frequencies of light coming into the planet in 2015 are going to be substantially increased to assist humanity to wake up even deeper. The upcoming festivals are going to be quite powerful due to the moon activations and the alignment of the planets within the Universe so there can be increased activity within each individual to assist Gaia through this process. I believe that we are hitting a climax within the festivals that is taking each initiate, ascended master, and light being into a new existence. This means there has to be more preparation to be ready for the exchange of light. The challenges are tremendous but the rewards are even greater. Know who you are in each moment, utilizing your tools of perception within yourself to look deeply at what you are experiencing within the four body system and be aware when something needs to be rectified. If every person were able to achieve this process within his or her lives, we would move much quicker into the 5th dimensional Earth. But, it is going to take us some time. I share with you, take advantage of the most powerful festivals of the year as you will be rewarded greatly for your efforts. I look forward to working with each of you through this process of enlightenment upon Gaia. ©2012-2015 Walking Terra Christa Academy of New Earth Mastery http://walkingterrachrista.com/ by Rev. Christine Meleriessee and Rev. J. Michael Hayden (Ara). Permission to repost this information electronically on your non-commercial website or blog is granted as long as you include this copyright statement and the following referral links. Use for commercial websites, blogs and printed or written reproduction requires written permission. We are in a most powerful acceleration of the first full moon in January. On the 4th of January we experienced the activation of the Full Moon within Capricorn of the Sun and Cancer of the Moon to merge within each other. Capricorn represents our livelihood in the material world and how we react within that element on a physical level; whereas, Cancer represents our connection to our inner self, our emotions, and creating a loving environment in our daily living. We could look at this as the Mental Body vs the Emotional Body trying to come into alignment. It is a time for us to look at what is necessary in both worlds and allowing them to be completely balanced. As we experienced the Crystalline Ray of Harmony and Balance to come into physical creation on the 31st of December, we are now being asked to delve deeper into our core essence. This ray represents the ability to fully resurrect what does not work for us any longer in order to achieve the equilibrium we are searching for. The aspects of this moon continue within that essence to allow us to look deeper in both aspects of our mental and emotional bodies to find the balance that we are all searching for within ourselves. The way that we have been living physically is a major part of this as in 2015 we need to be in deeper harmonization with our environment and others. The power of these energies presently just takes us into a journey of the self that will assist us to live more cohesively in our outside world. We cannot stay stuck in either aspect but allow them to come together more fully within our consciousness. This will then open up the doorway for the actualization of what we desire to achieve to come into our reality. This full moon also activates the Uranus Square Pluto energies that we have been experiencing during December. This is another element that will initiate our timelines through our Etheric Body. So some of the elements you may be experiencing could possibly be those memories of the times long ago in which you need to access to allow the divinity of the being you are to be fully actualized on a physical level. I believe that this is allowing the Feminine Divine to be even more activated within each individual. When we find the balance of the mind and emotions to be fully actualized, then we learn to see the depth of whom we are and what we are experiencing from our Highest Purpose and not the physical self. This is so very important to allow for the healing to continue within our four body system as it will mold our life in a completely different way than if we don’t accept our Higher Self to be the controlling factor in our existence. We are at a stage in our evolution, both personally and globally, that we can no longer be the person that we were previously. The energies are changing us to accept our divinity of light to be fully manifested within our physical existence. It must start with each of us individually in order for the world to accept it. This moon is the first step of the New Year to help us come fully into balance of our emotions and thoughts. It is a time to get rid of the cobwebs from the past in order to fulfill our destiny of love and acceptance. Take time during this full moon cycle to look deeply within your emotions and thoughts to see what does not serve your purpose any longer. Then call upon the essence of this earth and sky to assist in transforming them into your Highest Purpose that is waiting for your arrival to be fully manifested within your physical being. It is truly a magnificent beginning to 2015. Walking Terra Christa is holding their monthly Full Moon Celebration via teleconference (accessible via Skype) on Monday evening, January 5th, at 4:30 PM Pacific. 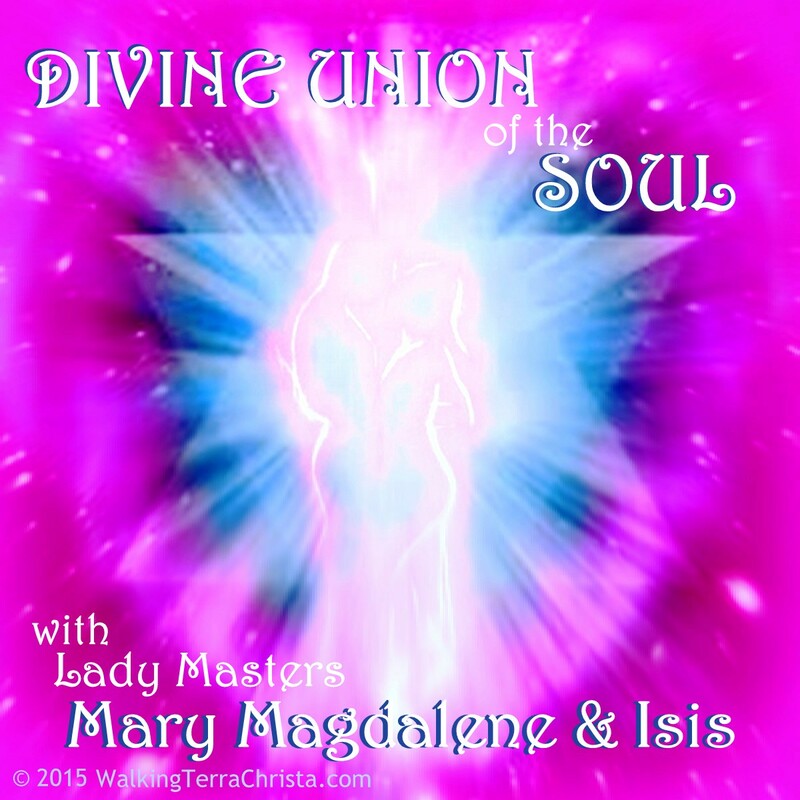 We hope you will join us as we connect with the Ascended Beings of Light within the Unified Whole Command at the Clarion Temple of Oneness. Details are available by clicking the link above (Walking Terra Christa). As we step towards a new year, I felt it was appropriate to share my views on this current year. The Ascended Beings of Walking Terra Christa called 2014 the Year of Grounding Unity. This meant that individuals would learn how to find more of their higher self energies to come into physicality to ground the Unity of Oneness within each of us individually. We have had massive movements of energy within this year. The cycles of the moon with eclipses have taken us into a whole new way of existence. We cannot forget the exchanges of the Solstices and Equinoxes to herald us into a new way of living upon this earth. The important elements to consider with all these changes in the planetary system are how did we favor individually? Just because the Universal changes are occurring in GAIA does not mean that each of us took these energies to make the necessary changes. We connect in the present moments of those powerful surges of light and hope that it will assist us in our journey. Some may even put so much credence into these frequencies that they think that is all they have to do, is to sit and wait for it to enfold. But most of us know that is not the case. The frequencies of Light are coming into GAIA to assist her planetary ascension; it is then that we as each human upon this Earth must look within ourselves and allow the change to happen to us. I know that this year has been intense and December has taken all those energies and rolled them into one month. We have had acceleration upon acceleration occurring for us which will help us to walk into a new part of our existence. As we become more Light, then we allow the old elements to purge out of us. We go through a state of transition in which we truly do not understand what is happening to us until we can readjust the energies within our physical body. This takes a lot of effort and patience within each of us as we grow into being more than we ever have before. But yet, it can cause great challenges as the old dysfunction has to be removed. When Walking Terra Christa asked about 2014, the Beings within the Unified Whole replied that it represented Grounding Unity which means that elements of our Higher Self and I AM Present were being ignited from the heavens above into our physical essence. The deeper our meditations, the more growth we would receive as there would be illumination of our past into our present moment. I believe that we have received all of these elements within us. There is so much change that is happening within this earth that the dysfunction is being arisen out of each individual person as people gather together in Unison. What we don’t realize is that bringing forth these energies is important while igniting the old parts of ourselves in the process. If an individual receives so much light within them, and they are holding unto old elements of dysfunction within them, they can ignite that dysfunction in a different manner. It does not mean that it is being dissipated just by being in a state of protest or anger. That is the anger acting out within itself which is not serving any purpose but bringing up those frequencies into the atmosphere. It is not assisting an individual to feel better about their situation or inner self; it is actually causing more confliction to occur. In retrospect that is exactly what this year represented in our society. People are starting to wake up but they are acting upon their old ways of warriorship. It is an automatic trigger that happens when the light comes within an individual that does not know how to handle the energy. They have not been trained to meditate, to step into the silence in order to receive the healing they need. Instead, it reacts within a person to trigger old elements within the Etheric body of the other timelines in which confliction occurred. It becomes a power struggle and is meant to bring forth elements within an individual that need to be addressed instead of lashing out onto society and what is not right within our world. As I started this writing, I wanted to share what this year represented to each of us. The world of Spirit constantly walks within me so I am feeling they have a deeper message here for each of us. THIS YEAR HAPPENED JUST AS IT WAS MEANT TO BE. 2014 people awakened to look differently at the world within themselves and around them. They want to do something about it while seeing change happen before them. The power of the Light presently brings forth change in each individual no matter what level of awareness or un-awareness that happens to each person. The world has been rocked with more light than it has ever received before. Each soul upon this earth is healing within themselves whether they realize it or not. On a soul level they have reached the ability to understand that their contract on this earth is being honored and they are stepping further into the process. This does not mean that each person knows within a conscious level what they are doing but the acceptance of the soul within their body is being guided within the healing states of sleep and is filtering into the world. I want to share more of this with the New Earth Frequency Update as I feel the Unified Whole Command becoming more apparent with this writing. I don’t want to spoil their message but just want to reiterate that whatever you have experienced this year, look at the depth of that pathway. Every one of us, no matter if you are on a pathway of ascension or not, is healing their soul’s contract upon this earth. Look deeply at your feelings, your love, your acceptance, your patience, and the parts of yourself that do not match these qualities. It will help you go into a deeper place within yourself. 2015 is being called “Embracing Harmony ~ Sending Love”. This means that those of us that are considered lightworkers need to find within our-self the harmonization of our existence. We have a role to play in 2015 as the Leaders of the New Earth to deeply honor our truth, our love, our Will, our Love, and our Power so that others can do the same. As we embrace our own harmonization and balance within us, then that essence of Love can be sent to humanity. This is done within our silence of the love that we are, not within words parse, but just Being Love Within. The Ray of Harmony and Balance is going to be ignited within the planet on December 31st at 12 midnight on a planetary level as we move into the year 2015. This ray is very powerful to move through conflicts and deep struggles. Master Serapis Bey is the Ray Chohan but Master Paul the Venetian is also going to be working within the essence of this Ray. (Paul the Venetian previously was the Ray Chohan and works very closely with Serapis Bey). Utilizing the Toning Sound will help to bring in the essence of the ray; or just call upon any of the Beings of Light to expand it within you. The Golden Etheric City of this Ray is represented within the Etheric Earth over the geographic area of Kansas/Oklahoma/Nebraska/Colorado in the United States known as the City of Klehma/Shaswam. Klehma is the 3D name; and Shaswam is the New Earth Name. You can also travel to this city in your meditations and/or sleep state. Check out our transcriptions located in our New Earth Consciousness – Circle of Light blog, Keyword: Klehma or Shashwam. The important element of this writing is to intuit these energies within yourself as much as possible to allow for the changes to occur in a balanced manner. 2015 is going to be another powerful year with each of us being asked to stand strong and be the Light that we have learned to incorporate within our physical world. 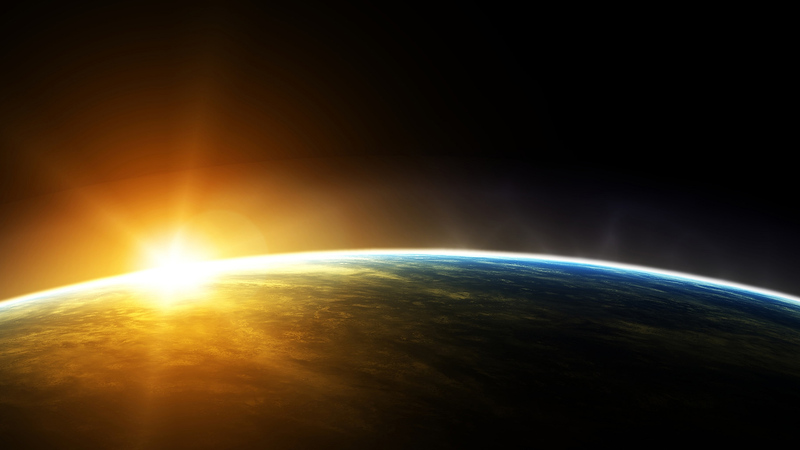 The New Earth Frequency Update “A Message of Love for 2015” can be read by clicking the link. ©2012-2014 Walking Terra Christa Academy of New Earth Mastery http://walkingterrachrista.com/ by Rev. Christine Meleriessee and Rev. J. Michael Hayden (Ara). Permission to repost this information electronically on your non-commercial website or blog is granted as long as you include this copyright statement and the following referral links. Use for commercial websites, blogs and printed or written reproduction requires written permission. 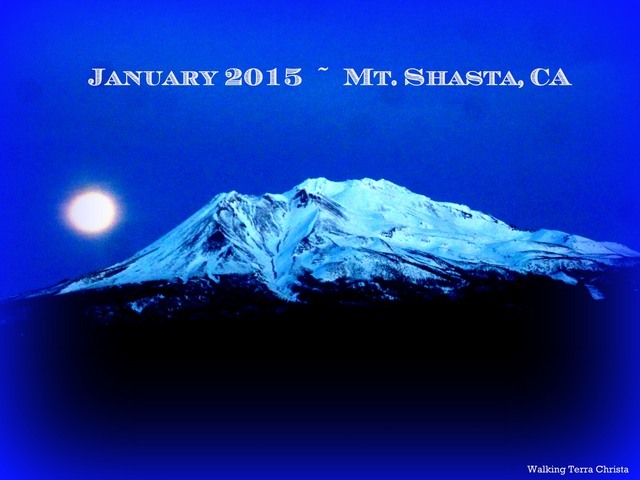 Walking Terra Christa is facilitating their Winter Solstice Retreat in Mount Shasta starting December 18th through the 21st, 2014 which will be hosted by Mahachohan Saint Germain and Lord Adama, High Priest of Telos. It is a journey into the heart to learn how to initiate, activate, and then actualize the seven Rays of God. It is also initiating the energies to be grounded within GAIA from this point forward. Each person that is participating allows these frequencies to be within the planetary structure to prepare for 2015. Each year we hold three retreats annually, Spring (Wesak) ~ Summer/Fall ~ Winter which are guided by the Ascended Beings representing our Team of Light. In 2014 we have taken an intensive journey through the Seven Rays of God. Retreat participants have found that the information and teachings that have been provided by the hosts of higher beings has been very profound within their life when they stepped away from the Shasta energies back into their own environment. For our December excursion into the world of Ascended Mastery we are being gifted with the work of Saint Germain who is now the Mahachohan (Leader) of all the seven rays. He and Lord Adama will work with us daily to assist each participant in their personal journey along with the other ascended Beings of Light that work with each of the Rays, i.e., Chohans, Archangels, and Elohim Masters. Each day of the retreat we will have a special journey into an Etheric Temple of Light hosted by the specific leader for the day. We are providing the availability to receive an MP3 download on each of these meditative journeys from the retreat for those that cannot attend physically in Mount Shasta. We believe that these journeys will help to release old karmic debts and impart new knowledge’s through our I AM Presence. During the journey we will meet with the Spiritual Hierarchy within the retreat which is housed underneath the mountain. We will work with the Karmic Board on any timelines or karma that needs to be rectified for our present pathway along with receiving special attunements from the Great Divine Director on the initiation of this journey. We will continue working with the Six Rays of God to transmute any elements from the previous day’s journey. Saint Germain will guide us to Table Mountain, Wyoming to the “Cave of Symbols” which is a cave in the mountain lined with pink and white crystals that gives way to a gigantic chamber covered with rainbow colored stalactites that form symbols representing sacred geometry. Each participant will work through the revelations they received from the Royal Teton Retreat. This retreat houses the “Cosmic Mirror” in which an individual will see the cause and effect of their karma along with the “Atomic Accelerator” which brings forth electrons in the Light Body to make the necessary changes, and lastly, the “Sphere of Light” which is a room that will help an initiate in their ascension process. We now start the work within the 7th Ray of the Violet/Purple Flame with the Archangels Zadkiel and Amethyst along with the Elohim Masters Arcturus and Virginia. Our first visitation on this day will be “The Cathedral of the Violet Flame” in the Rocky Mountains which includes all Violet Flame Angels and Priests and Priestesses of the Violet Planet representing elemental life. This retreat represents to ability to be cleared of human burdens and densities. 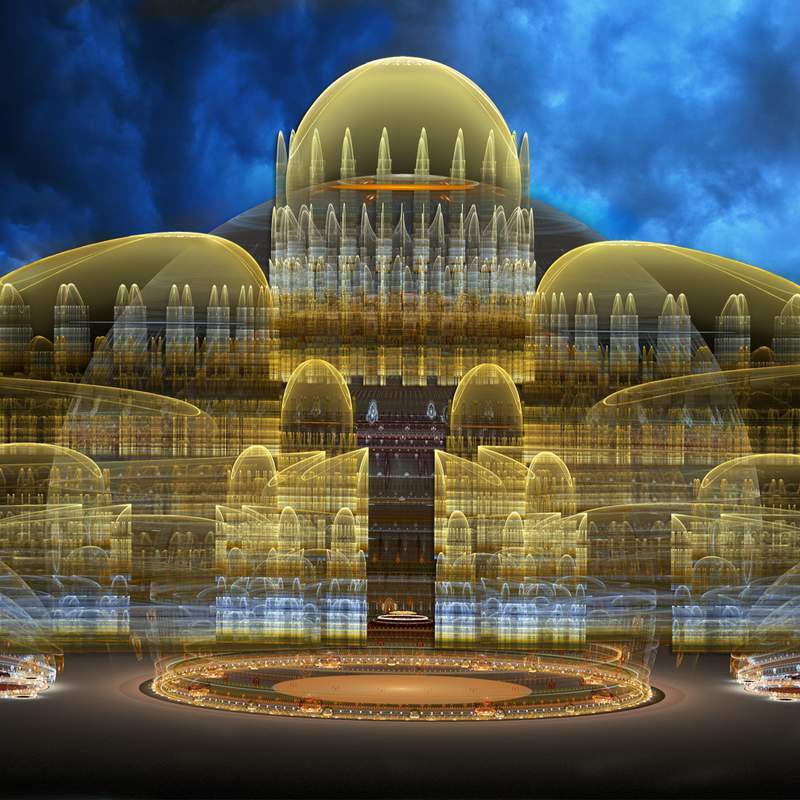 Our second visitation will be the “Temple of Purification”with Archangels Zadkiel and Amethyst which is located over the islands of Cuba (previously known to be the location of Atlantis). Part of the initiation for this journey will represent the work with the Order of Melchizedek as training as a Priest/Priestess along with learning the true meaning of “spiritual freedom. The third visitation will be the “Temple of Freedom” with Elohim Masters Arcturus and Virginia which is located over Luanda, Angola; they release the violet, purple and pink flames of mercy, forgiveness, transmutation and freedom for the entire planet, as a giant fiery pillar. We will be utilizing the Violet Flame to overcome difficult situations on a personal and planetary scale, to transmute darkness into light. We will close the energies of the 7th Ray with Saint Germain and Lady Portia by visiting the Golden Etheric City of Wahanee/Fronlamm which is located in the 5th dimensional earth over Atlanta, Georgia and North Carolina. This city represents the 7th flame of Ceremonial Magic and Freedom. We will work with Lady Portia, Lord Teesian and Lady Teesio (representing the Elders of this flame). Lord Sanat Kumara will make his presence known opening up the energies for the Venusian Rays of God for 2015. If you feel aligned with this work and our teachings, Walking Terra Christa is happy to provide the Retreat Audio MP3 downloads of these amazing journeys to all those who are unable to attend our retreat in person. Please see our Journey Retreat website page to receive these recordings for a nominal exchange. We also have a free Holiday Gift for all those who want to assist in creating the New Earth through Ascension Mastery using one of our most recommended meditations.